With warmer weather and sunshine just around the corner, bringing the party outdoors is a must. For the perfect pool, garden or birthday party, simply pitching a tent and adding a mason jar isn’t going to wow your guests. If you’d like to be the “hostess with the mostest” and have a jaw-dropping party, lets play a little bit of “dress up” with your party space. They are ever so simple and yet they add so much life to your trendy tent if executed effectively. 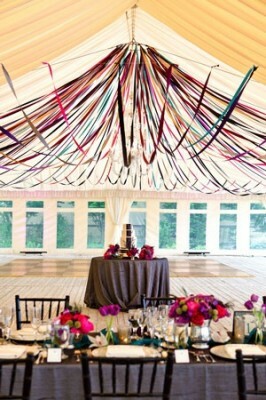 If you’re looking for pops of color with style, draping ribbons across the canopy will amaze any guest. 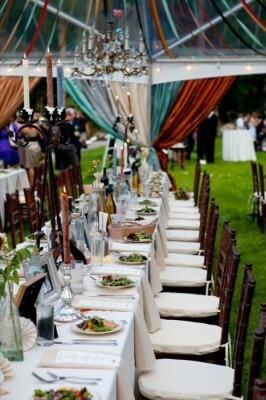 Matching the ribbon to napkins and linen is a great way to tie the table to the tent. Vibrant shades of yellow and orange are very popular this spring, as well as muted greens and blues. 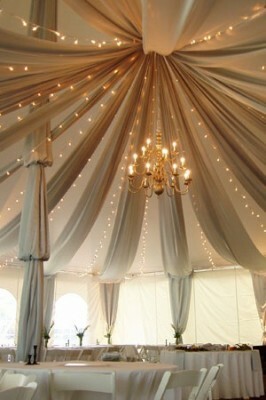 This tent matched metallic ribbons to draped curtains surrounding the tent, creating a very miraculous environment. Don’t limit yourself to tables and chairs for your tent party. Sofas, lounge chairs and side tables with lamps can create a very comfortable and chic spot. This set up is perfect for book clubs, pool parties and tea parties. If this sounds expensive, it doesn’t have to be! Combining thrift store furniture and floral blankets can create a very organic feeling. Over stuff the space with mismatched pillows, blankets and lamps, leaving the space empty will look cheap and unwelcoming. Pairing the room with mason jars of lemonade and paper lanterns will make your party super trendy and inexpensive. Fabric swags are pieces of fabric that are fastened to hang in a drooping curve, creating avery elegant atmosphere. Fabric swags can be hung inside the tent against the canopy or can be draped over a tent frame. Pair them with twinkle lights, vines and multiple colors depending on your party theme and taste. To create a one-of-a-kind trendy tent, it’s time to think outside of the typical streamersand curtains. Hanging chandeliers from the ceilings creates a stunning and expensive feel. 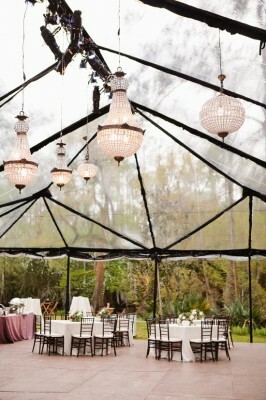 Clear tents are also an upcoming trend. 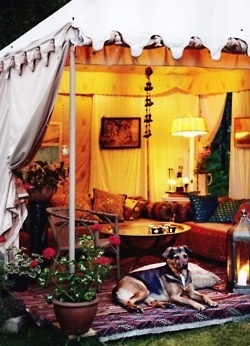 Paring them with colored fabric swags or chandeliers can create a very unique and interesting tent. Branches are also becoming increasingly popular within tents. Hanging lights or garlands on the branches can add more decoration and add further creativity to the room.